The patient had exploration of the mass, which showed an intercostal lung hernia originating from the utility port site of the video-assisted thoracic surgery in the right third intercostal space in the anterior axillary line (Figure 2). The lung was reduced with any sequelae and the defect was repaired with a polytetrafluoroethylene patch anchored to the adjoining ribs. There has been no recurrence of the hernia to date. Figure 2. Intraoperative picture of the defect in the chest wall. Lung hernias are rare. Lung tissue can herniate through a defect between the ribs (intercostal hernias) or through the superior thoracic aperture.1 Lung herniation usually results from trauma to the chest wall. It could also follow inadequate healing following thoracotomy and has even been reported to spontaneously occur after a bout of coughing.2 In intercostal hernias, the anterior thorax is the site of predilection because it lacks the muscular support of the posterior thorax provided by the trapezius, rhomboids, and latissimus dorsi muscles.3 Postoperative intercostal hernias are reported more commonly after less extensive surgical procedures such as video thoracoscopy than after major thoracic interventions. It may be due to a less meticulous closure of the mini-incisions as opposed to routine thoracotomy closure.4 Uncomplicated lung hernia can be asymptomatic. However, the common presentation is a spongy, crepitant, well-demarcated, subcutaneous swelling that enlarges on physical strain or coughing as well as audible breath sounds on auscultation. Lateral and oblique radiographs may disclose lung parenchyma outside the bony cage and, rarely, a larger-than-normal intercostal space. A computed tomographic scan is necessary to assess the exact location and size of the defect. 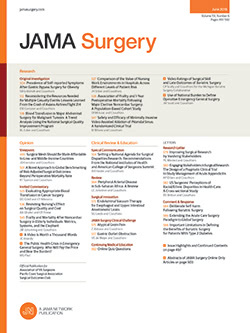 Spiral computed tomography with the patient performing the Valsalva maneuver may provide the most accurate imaging method.5 Spontaneous regression has been observed in small asymptomatic hernias; however, it is now generally accepted that large hernias or hernias with a risk of incarceration are treated by surgical repair.6 The approach to surgical repair varies from video-assisted thoracic surgery, especially for spontaneous intercostal hernias, to conventional thoracotomy in the presence of multiple thoracic injuries.7,8 Repair of the hernias involves reduction of the herniated lung with assessment of its viability, which may indicate resection if the lung is found to be compromised, and closure of the defect with adjacent tissues9 using pericostal sutures uses synthetic mesh10 such as polytetrafluoroethylene as in our case or plastic repair for large defects. Correspondence: Sandeep Sainathan, MD, Department of Surgery, Bronx-Lebanon Hospital Center, 1650 Selwyn Ave, Apt 16 G, Bronx, NY 10457 (surgeon_sandeep@yahoo.co.in). Accepted for Publication: August 15, 2011. Author Contributions:Study concept and design: Sainathan, Pugalenthi, Danovich, Fox, and Andaz. Acquisition of data: Sainathan, Fox, and Andaz. Analysis and interpretation of data: Sainathan and Andaz. Drafting of the manuscript: Sainathan, Fox, and Andaz. Critical revision of the manuscript for important intellectual content: Sainathan, Pugalenthi, Danovich, and Andaz. Obtained funding: Andaz. Administrative, technical, and material support: Sainathan, Danovich, and Andaz. Study supervision: Sainathan, Pugalenthi, Fox, and Andaz.